Time-saving technology helps HR managers quickly turn new hires into key performers. This product revolutionizes employee onboarding by turning it into a quick and simple activity for the new hire, rather than a tedious task for the HR department. Employee benefit and HR technology innovator CheckPoint HR, Inc. today introduced a self-service portal designed to transform the way businesses manage employee onboarding. 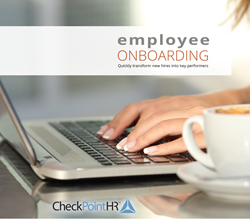 Integrated with CheckPoint HR’s human capital management technology platform, the cloud-based onboarding solution eliminates data entry and minimizes errors by automating the tasks required for a compliant and consistent onboarding process. The first 90 days are critical in determining whether a new employee will stay with an organization. That means the content and delivery of an employer’s onboarding process can mean the difference between a failed hire and a long-term contributing employee. CheckPoint HR’s self-service portal ensures a proficient process that reflects the organization’s brand and messaging. Employers can configure their onboarding portal’s content based on their workflow and customize the look and feel to reflect their organization’s brand. Employers determine the required documents and the process for obtaining digital signatures and other approvals. A custom welcome screen provides a to-do list for the new employee based on the selected workflow. A self-service data sheet pre-populates the forms that follow so employees don’t need to keep re-entering the same information. Completed forms are securely stored in the “My Documents” section” so employers can always have them on hand. The solution also offers a user-friendly management portal, so hiring managers can track employee progress through the system. The manager to-do list details tasks, including items to approve or documents to countersign. Managers can filter the information by employee, document or other criteria. A total employee benefit and human resource solutions provider, CheckPoint HR empowers businesses of all sizes to save money and administrative resources while offering more choice and flexibility to employees. Our expert employee benefit team offers unrivaled expertise in employee benefit strategy, selection and administration. Our proprietary insurance marketplace, CheckPoint Choice, delivers a full-service private exchange that is affordable and easy to manage. Our technology fully automates the HR and employee benefits process from recruitment through retirement. Collaborating with our employee benefit and human resource experts, CheckPoint’s software developers incorporated key industry best practices into a compliance-aware rules engine that takes the guesswork out of employee benefits and HR. The result is efficiency, accuracy, risk mitigation and significant cost savings. To learn more, visit http://www.checkpointhr.com or view a short video at https://www.youtube.com/watch?v=Xo5QBNX1Kw4.